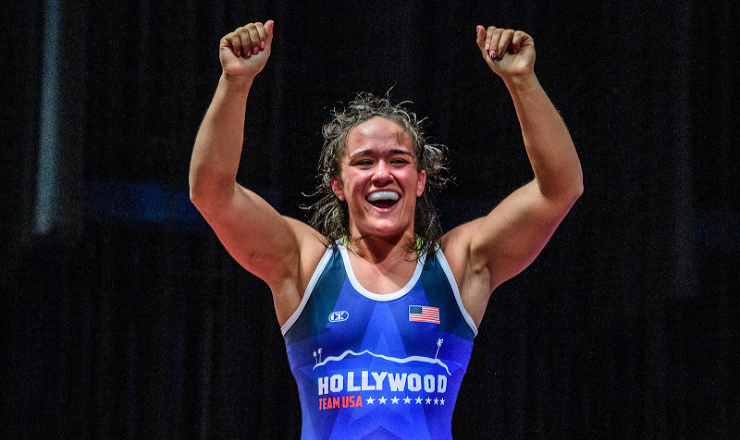 LOS ANGELES — The U.S. women’s senior freestyle wrestling team won handily against a team of stars from India and Mexico at the fifth annual Beat the Streets Gala at the Wiltern Theater in Los Angeles. Titled “Hollywood Wrestles Bollywood,” the event featured bouts for all 10 of the international weight classes as well as two exhibition bouts with high school wrestlers who have come through Beat the Streets LA. Perhaps the most exciting moment of the event came at 59 kilograms, when USA’s Alli Ragan took advantage of a scramble situation against Sarita of India on their feet and came out the back door to try and finish a takedown. Sarita held a tripod position, with neither of her knees touching the mat, thus preventing takedown criteria. Ragan instantly locked up Sarita around the waist and hit a picture-perfect back arch throw for four points, electrifying the crowd. Ragan would go on to win 9-1. Mallory Velte wrestled a back-and-forth match with 2016 Olympic bronze medalist Sakshi Malik at 62 kilograms. With 56 seconds left, the two wrestlers were tied 4-4, but Malik held criteria, having scored last. Velte increased her activity and pummeled furiously before catching Malik off-guard with a powerful foot sweep to go ahead 6-4. Malik responded by pushing the pace for the final twenty seconds trying to finish a deep shot. But Velte showed incredible balance preventing the takedown and spinning behind in the final seconds to score a takedown of her own and seal the win 8-4. 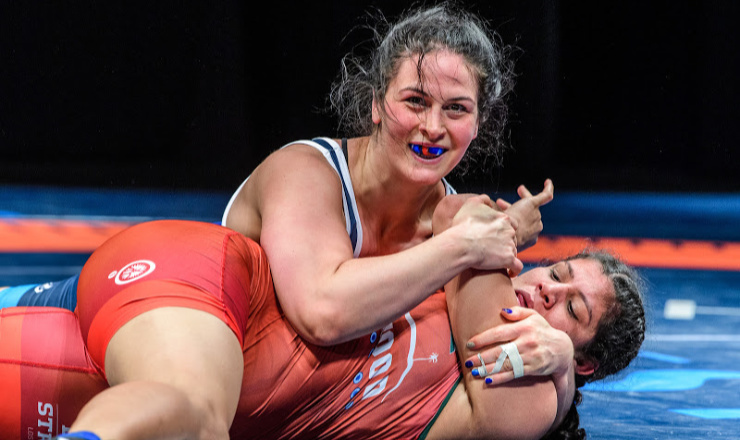 Several American won in dominant fashion, including four-time world champion Adeline Gray, who scored with both takedowns and turns before gaining a tech fall and a pin against Sudesh in the first period. Sarah Hildebrandt also scored a first-period technical fall at 53 kilograms, although the opponent wasn’t who she had been expecting. Due to a conflict, India’s Vinesh Phogat was unable to compete. Vinesh had defeated Hildebrandt last month at the Dan Kolov tournament in Bulgaria. USA head women’s wrestling coach Terry Steiner was pleased with his team’s performance. Prior to the start of the senior level matches, one of the two exhibition bouts saw a slight upset at San Pedro High School’s Sydney Barrios, who placed eighth in the state tournament, defeated Gianna Anaya of San Fernando, who was a state finalist. In addition to having three of the four wrestlers in the exhibition bouts, the San Fernando Girls wrestling team — a Beat the Streets program — was recognized during intermission for winning the 2019 California state championship, which pools from over 740 girls wrestling teams.